Have you guys played videogames before? No? You should really try them out. They are the best. And besides, life is too short to waste on ever going outside. Many thanks to Dan and Andy B for helping me write this strip! Props for being one of the few people on this *PLANET* with the good taste to favor FemShep. Asides from potential eye candy, why? Is it like a “In the future, we don’t need MEN as our heroes anymore” vibe? Meh. Yeah, quite right, because even acknowledging women exist in the future is a slur against men! It’s more because the voice actor for Fem Shep does a much better job. Joker is easily my favorite Seth Green role. 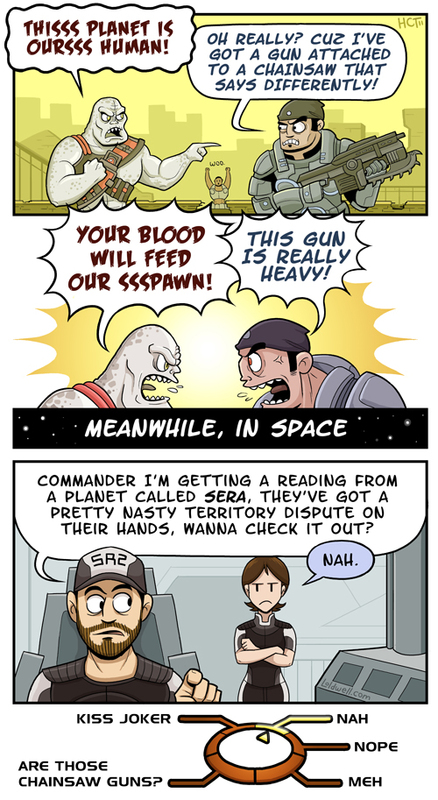 Wait, does this mean that there are people in the Gears universe who aren’t ridiculously pumped up?